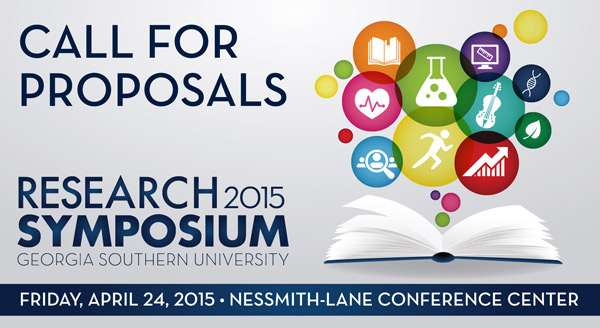 Georgia Southern University is now accepting abstracts/proposals for The 2015 Research Symposium. Faculty and Students from Georgia Southern University and regional colleges and universities are invited to participate. The Research Symposium is a conference style showcase of student and faculty research across multiple disciplines. This event includes speakers, poster and paper presentation sessions from all academic disciplines. Abstract/proposals submissions will be considered for poster presentations, paper presentations, interactive roundtables/panels, or performing or visual arts. Space is limited; not every submission will be chosen. A review committee will evaluate each submission for content and relevance. Abstracts can be submitted under only ONE topic area and must include an abstract synopsis of 300 words or less. All presenters must register for the Symposium online at https://research.georgiasouthern.edu/symposium. Cash prizes will be awarded to students for top poster and top presentation per research topic area. Student poster and presentations will be judged and awarded based on abstract/proposal submissions and the presentation of their work on the day of the Symposium. All prize winning presentations & posters will be posted in Digital Commons. For more information about the Annual Research Symposium, please contact Marla Bruner at mbruner@georgiasouthern.edu.